RouterOS supports multi-core and multi-CPU computers (SMP). You can run it on the latest and greatest Intel motherboards and use the newest multicore CPUs. RouterOS supports installation on IDE, SATA and USB storage devices, this includes HDDs, CF and SD cards, SDD disks and more. You need at least 64MB of space to install RouterOS, which will format your partition and become the default operating system of the evice it?s in. 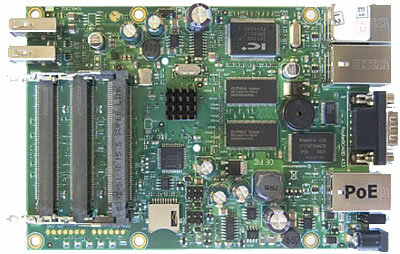 Of course RouterOS has a multitude of supported network interfaces, including the latest 10 Gigabit ethernet cards, 802.11a/b/g/n wireless cards and 3G modems. programming interface for building your own control application. In case there is no local access, and there is a problem with IP level communications, RouterOS also supports a MAC level based connection with the custom made Mac-Telnet and Winbox tools. RouterOS features a powerful, yet easy to learn commandline configuration interface with integrated scripting capabilities.